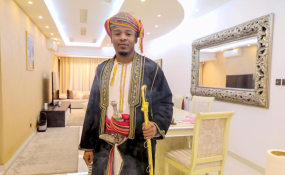 Tanzanian tourism Minister Dr Hamis Kigwangalla has offered to pay Alikiba's honeymoon bills. King Kiba and his brother Abdu Kiba held a double wedding on Sunday that was attended by top Tanzanian celebrities and politicians at Serena Hotel in Dar es salaam. Chief guest former Tanzanian president Jakaya skipped the event and instead sent his wife Salma Kikwete. Mrs Kikwete offered apologies on behalf of her husband, explaining that he had traveled abroad on the eve of the wedding. Ali Kiba and his wife are scheduled to travel to Venice, Italy, for their two-weeks honeymoon. "Congratulation Ali Kiba and your wife for your marriage... I will give you guys an offer, find any tourism attraction site that pleases you both for your honeymoon and I will foot all the expenses for the trip," Dr Hamis said. Other Tanzanian politicians who graced the occasion included Minister for Youth, Work and Employment Antony Mavunde, Minister for Gender Ummy Ally Mwalimu, Member of parliament Ridhiwani Kikwete as well as Mombasa Governor Ali Hassan Joho . Celebrities in attendance included Mwana FA, Christian Bella, Vanessa Mdee, Mimi Mars, comedian and former big brother winner Idriss Sultan, Ommy Dimpoz and renowned Tanzania media personality Millard Ayo.